Allen Langdon, President & CEO of Return-It at the launch of the textile recycling pilot project. For SMART, increasing awareness of textile (any fabric made of interlacing fibers) recycling and its impact on the environment is of utmost importance. Textile waste has a dramatic global impact: the average adult throws away 81 pounds of clothing each year. Out of this waste, 95 percent could have been recycled, yet only 15 percent actually gets donated or recycled, with a staggering 85 percent of textile waste ending up in landfills. SMART's for-profit membership works to make a difference using innovative technology and creating new best practices for textile recycling. Bank & Vogue, a Canadian-based leader in trading used textiles, diverts more than 90 million pounds of used goods from around the world, saving them from landfills. 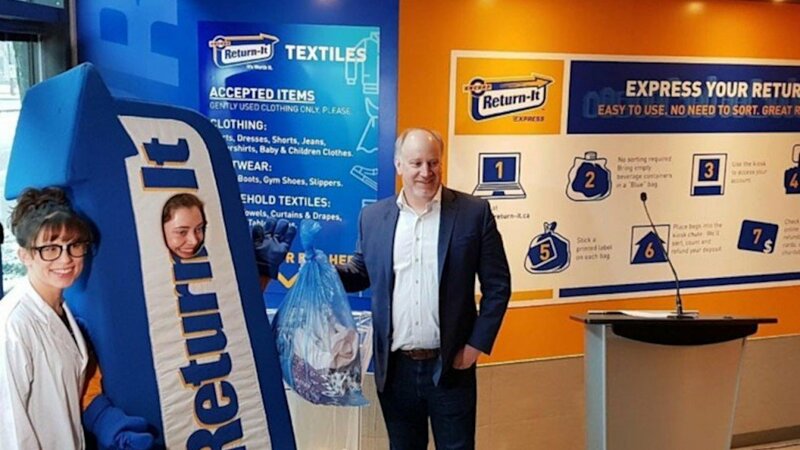 The company recently joined forces with the largest recycling depot network in British Columbia, Return-it, to pilot a convenient textile recycling program where residents of Vancouver, BC are encouraged to drop off gently used clothing, shoes and other household textiles at Return-It depots throughout the city. "Our aim is to maximize convenience for the residents of Vancouver and increase the merit of each trip to recycling depots," says Allen Langdon, President & CEO of Return-it. "Residents already drop off refundable beverage containers and unwanted electronics at Return-It depots, so adding textiles as accepted items is a win-win for us and our environment." Philadelphia-based Monarch Brands is playing their part by processing roughly 3 million pounds of textiles annually and giving them new life as high-quality towels and linens for the hospitality industry, microfiber cloths, wiping rags and more. The company utilizes cutting-edge technology to reduce textile waste by more efficiently processing materials at its 300,000 square foot, 12-acre plant in northeast Philadelphia. For instance, when used linens, are brought to Monarch Brands they may contain substances that may be harmful to humans as well as the surfaces they are cleaning. This is especially true when buying from hospitals and hotels, as items like syringes, cutlery, pins, broken surgical equipment and even nuts and bolts can be found in bailed up linens. To ensure the health and safety of everyone who comes into contact with their products, Monarch Brands utilizes an extremely sensitive metal detector fastened above their conveyor belts that blows rags with trace amounts of foreign objects into a discard bin. The process can be seen here. "This Global Recycling Day, we're celebrating the innovation of our members and their tremendous positive international impact on landfills and the environment," says Jackie King, executive director of SMART. "When companies like Bank & Vogue and Monarch Brands put their best products forward, we're proud to know they're doing so environmentally-friendly!" SMART advises the public that they can make a difference by keeping textile recycling top of mind. Household items such as clothes, shoes, belts, curtains, purses, stuffed animals and more can be recycled as long as they are clean, dry and odor-free, meaning they are free of mold and have not been contaminated with solvent-type liquids such as Goof Off or gasoline. For information on SMART, or to learn what options are available to recycle textiles, visit www.smartasn.org.